Wed., May 23, 2018, 8:02 a.m.
MONACO – For Ferrari to win in Formula One, it needs to stop gifting points to Mercedes. Things could start to change at this weekend’s Monaco Grand Prix. Ferrari dominated the race last year, securing a 1-2 finish as Sebastian Vettel beat Kimi Raikkonen. Defending champion Lewis Hamilton has won the last two races with Mercedes this season to move 17 points ahead of Vettel in their title battle despite trailing by the same amount after Vettel won the first two. With both drivers chasing a fifth F1 title to move level with Argentine great Juan Manuel Fangio. 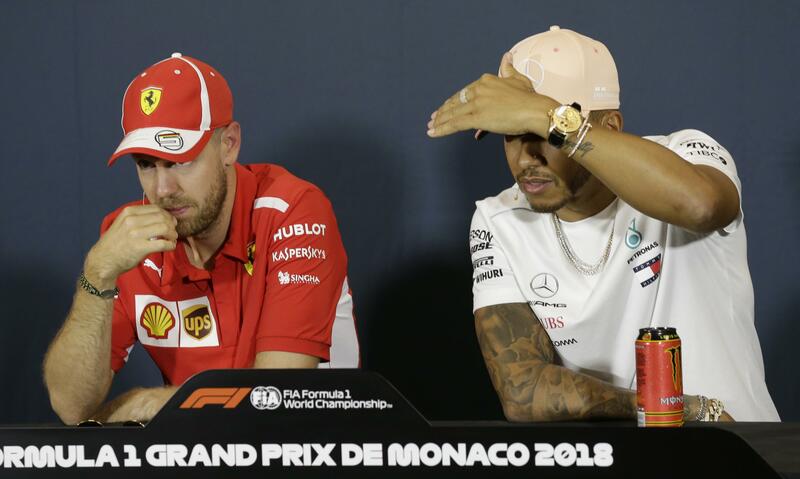 Hamilton and Vettel sat next to each other at a pre-race new conference on Wednesday. Because of the glare of the cameras, they slipped on sunglasses. Hamilton put his on first, and Vettel quickly followed suit. Rivals, it seems, in everything they do. But it’s Ferrari that needs to stops conceding points like an unplugged oil leak. Vettel took pole position in Azerbaijan two races ago. But in that race he found himself second after a botched pit stop. Then, he made a rash error of judgment late on and dropped down to fourth, rather than consolidating a position of strength against Hamilton. Vettel struggles to contain his composure at times. Late last season, the German driver threw away the chance to regain the championship lead from Hamilton with a similarly brash move during the Singapore GP. It set the tone for the remaining races, as his title bid spiraled out of control. The lost points are not all down to Vettel, however. At the Spanish GP two weeks ago, he lost track position after Ferrari called him in for an extra stop for tires and finished fourth again. The decision seemed overly risky and revealed a tendency to make panicky calls within the Ferrari team. Although Mercedes grabbed a 1-2 finish in Barcelona, it remains to be seen whether it was a one-off and Ferrari still has more pace. Barcelona’s track layout and surface suited Mercedes, whereas Monaco’s is more awkward. Because of the tight and twisty nature of the 3.4-kilometer (2.1-mile) street circuit, whoever takes pole position on Saturday is favored for victory in the glittering jewel in the F1 calendar. After a poor race last year – Valtteri Bottas finished fourth and Hamilton was seventh – Mercedes is understandably cautious. Red Bull has a good chance because the curvy track has less long straights, thus negating the superior speed of Mercedes and Ferrari. Both Red Bull drivers have shown good speed, although consistency remains elusive. Daniel Ricciardo won in China , but teammate Max Verstappen is looking for his first win after an incident-packed season. The Dutch driver has failed to finish twice and has been embroiled in typically controversial moments. Ricciardo crashed into the back of him in Azerbaijan as they fought for position with a podium in sight, and both went out. It earned both drivers a stern rebuke from team principal Christian Horner, but tensions have apparently appeased. A strong third-place finish in Spain reassured Verstappen heading to Monaco. Published: May 23, 2018, 8:02 a.m.